With cascading falls ,ancient caves and panoramic views, the Blue Mountains offer a beautiful, relaxing alternative to the hustle and bustle ofthe SydneyCBD. Named for the blue haze blanketing the region, the Blue Mountains are a natural wonderland located just a leisurely two-hour drive west of Sydney. 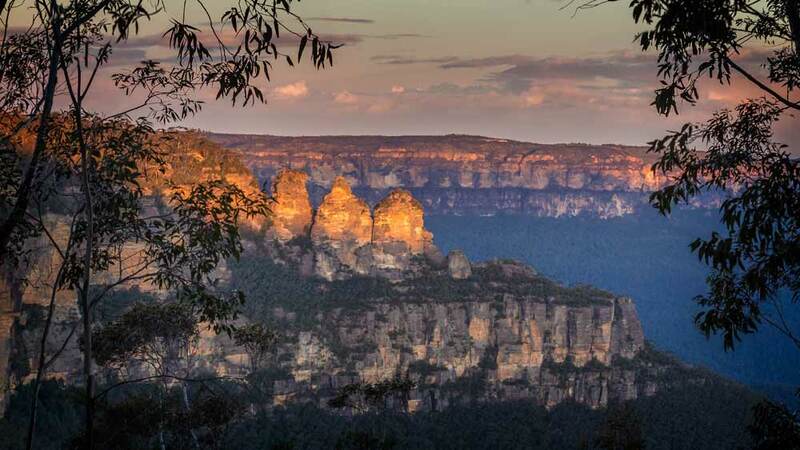 The first item on the ‘must visit’ list for the Blue Mountains is the iconic Three Sisters at Echo Point. Legend has it the rock formation represents three Aboriginal sisters who lived in the Jamison Valley and were turned to stone. Steeped in history, the Jenolan Caves are truly a sight to behold. Explore the 11 show caves on a guided tour – and while you’re there, be sure to pay a visit to the spectacular Blue Lake. Looking for that ‘wow’ factor? When it comes to views of the Blue Mountains, there’s no better vantage point than a glass-floored gondola. Take a trip on the Scenic Skyway and enjoy the views. Visitors to the Blue Mountains will want to bring comfortable walking shoes to explore the many walking tracks on offer. For the time-poor day-trippers not able to take on the historic Six Foot Track, the Princes Rock Walk is a great alternative. The 1.8km, hour-long walk boasts impressive views of Wentworth Falls and Mount Solitary. The sprawling Blue Mountains Botanic Garden at Mount Tomah is well worth a wander. Home to the Wollemi Pine, one of the world’s oldest plants, the Garden has a rich Indigenous history. Visitors can take an Aboriginal Heritage Tour to learn about the area’s cultural heritage. No visit to the Blue Mountains is complete without a stop off at the majestic Wentworth Falls. Admire the view from Fletchers Lookout, and explore the lush greenery in one of the family-friendly walking tracks. Exhausted by all that walking? Take a well-earned break in one of the Blue Mountains’ many scenic towns. Leura is renowned for its quaint shopping strip, and an abundance of coffee shops, galleries and boutiques. The Toy and Railway Museum is a treat for the kids and the young at heart. Katoomba is home to many of the region’s top attractions. Stop for lunch at a bustling cafe, and stock up your car’s picnic hamper with gourmet food from the town’s variety of specialty shops before heading out to the Three Sisters. Drive on from Katoomba to discover Blackheath, a picturesque village near the top of the Blue Mountains. Enjoy the view from Govetts Leap, browse the village boutiques or stop for a warming bite at one of the many cafes and restaurants. If you’re visiting in November, check out the spectacular Rhododendron Festival.